I’ve been a proud member of the Daring Bakers challenge group since October of this year (2010). 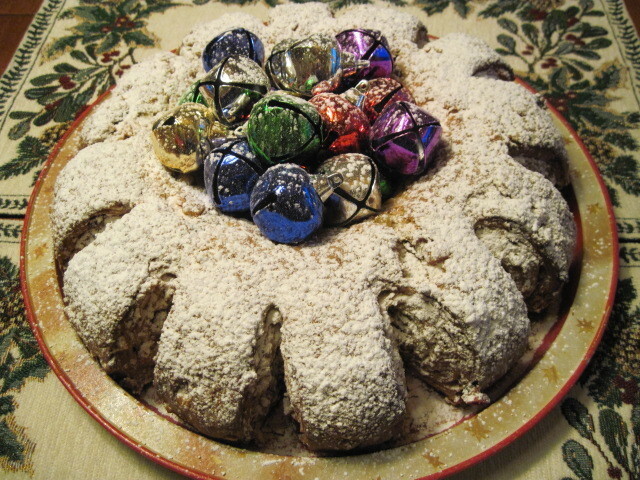 The first challenge I participated in (October) was making pumpkin doughnuts, the second (November) was an Italian Crostata and now my third, in the month of December 2010, a traditional German stollen that was chosen as the recipe to challenge AND excite the likes of (let’s just call us) “baking enthusiasts”. Being as though I’m still new to this group, I feel I have a long way to go regarding blog postings and having a complete understanding of how and why each month’s challenges (recipe selections) are chosen (and by whom). However, I am more than willing and excited to participate, even if I make a few mistakes along the way. 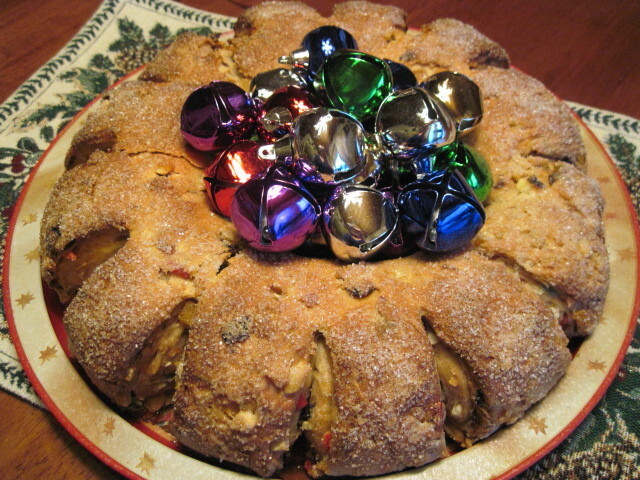 Stollen is a bread-like fruitcake made with yeast, water and flour, and usually with citrus zest added to the dough. Over the centuries, the cake changed from being a simple, fairly tasteless “bread” to a sweeter cake with richer ingredients. -Soak the raisins in a small bowl with the rum and set aside. *Note: If you don’t want to use alcohol, soak your raising in the lemon extract or fresh lemon juice. -Pour 1/4 cup warm water into a small bowl, sprinkle with yeast and let stand 5 minutes. Stir t dissolve yeast completely. -In a small saucepan, combine 1 cup mile and 10 tablespoons butter over medium-low heat until butter is melted. Let stand until lukewarm, about 5 minutes. -In a large mixing bowl, stir together the flour, sugar, salt, cinnamon, orange and lemon zests. -Then stir in the yeast/water mixture, eggs and the lukewarm milk/butter mixture. This should take about 2 minutes. The dough should be soft, but not sticky. When the dought comes together, cover the bowl with plastic wrap and let it rest for 10 minutes. -Add the mixed peel, soaked raisins (drained) and the almonds. Mix on low speed to incorporate fully. Here is also where you can add the cherries being carefully to be delicate or all your dough will turn red. -Sprinkle flour on the counter and begin kneading the dough to distribute the fruit evenly, adding additional flour if needed. The dough should be soft and satiny, tacky but not sticky. Knead for approximately 8 minutes. You can tell when the dough is kneaded enough as a few raisins will start to fall off the dough. -Lightly oil a large bowl and transfer the dough to the bowl, rolling around to coat it with the oil. Cover with plastic wrap. -Chill dough overnight in the fridge. The dough becomes very firm in the fridge (since the butter goes firm) but it does rise slowly. The raw dough can be kept in the fridge up to one week and then baked on the day you want. 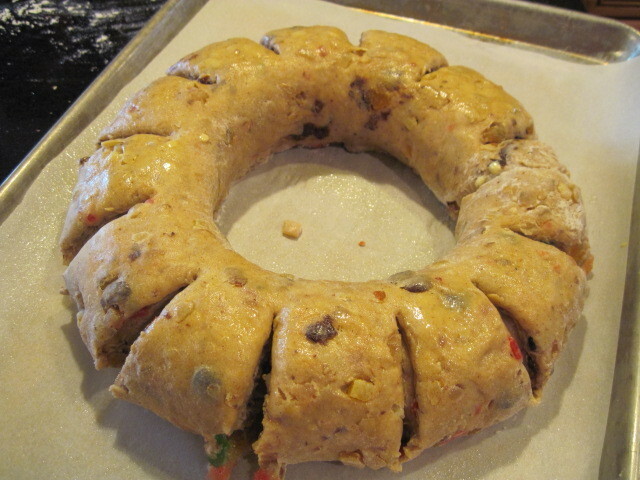 -Let the dough rest for 2 hours after taking out of the fridge in order to warm slightly. -Line a sheet pan with parchment paper. 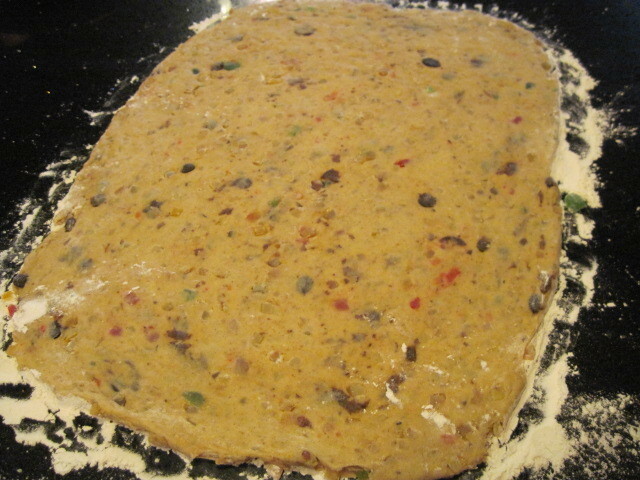 -Punch dough down, roll into a rectangle about 16×24 inches and 1/4 inch thick. -Starting with the long side, roll up tightly, forming a long, thin cylinder. -Transfer the cylinder to a parchment lines sheet pan, form into a circle and join the ends together pinching with your fingers to make them stick. -Using a knife, make cuts along the outside of the circle in 2 inch intervals, cutting 2/3 of the way through the dough. -Mist the cough lightly with cooking spray and cover loosely with plastic wrap. -Allow to rise for approximately 2 hours at room temperature, or until about 1 1/2 times it’s original size. -Bake the stollen for 20 minutes, then rotate the pan 180 degrees for even baking and continue to bake for 20 or 30 additional minutes. The bread will bake to a dark mahogany color and sound hallow when thumped. -Transfer to a cooling rack and brush the top with melted butter while still hot. -When completely cool, store in a plastic bag or leave it out uncovered overnight to dry out slightly, German style. -The stollen tastes even better in a couple of days and it toasts superbly. We gave the remainder of our stollen to our German friend, John. He thoroughly enjoyed it and said it was better than his moms (not that I believe him but it was a nice thing to hear). -Stollen freezes beautifully for up to 4 months. -The baked stollen stores well for 2 weeks covered in plastic wrap on the counter at room temperature. 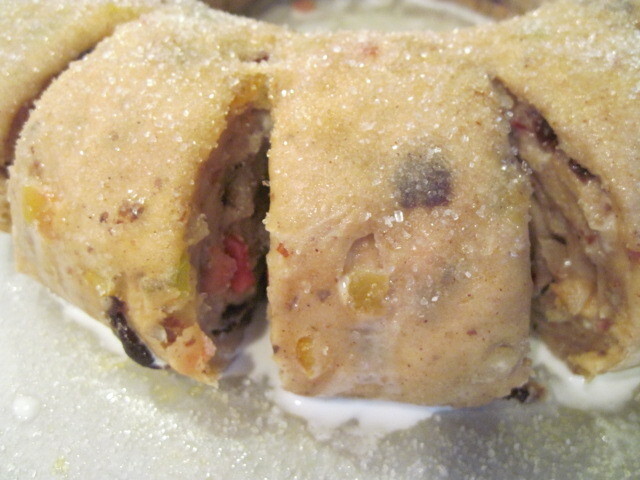 -The baked stollen stores well for 1 month, covered in the fridge. 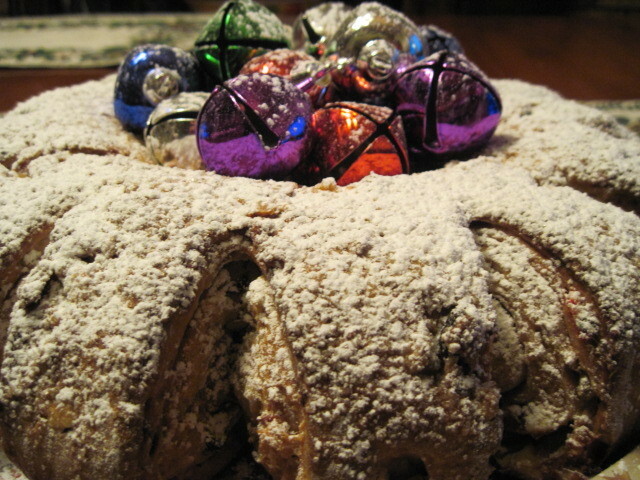 This stollen was a nice addition to our German Christmas eve feast and looked very pretty on the table! Can’t wait to see what next months challenge will be! Stay tuned to find out, won’t you? Wow! 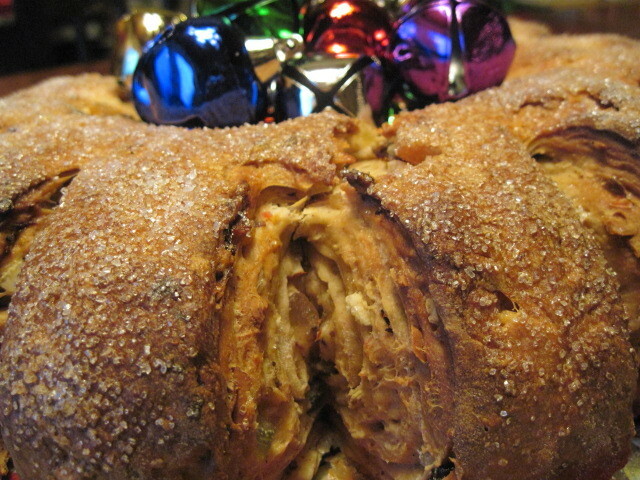 You did a beautiful job on the stollen and I love how you decorated it! I also loved the photo of your gingerbread centerpiece you posted earlier. Believe John's compliment. Men don't say that anything is better than their mother's unless it really is!